Fair warning: even if this movie is recommended for a wider audience than just Soumitra Chatterjee enthusiasts (aka sonpapdis*), this blog post might not be. guns, whooshing wind, flickering lanterns, and an overall sense of doom. "I feel like I already know the contents of this house," says Soumitra (I have no idea what his character's name actually is because everyone else just calls him huzoor and malik, so the actor's name will do), who is visiting the area as part of his work as a tax collector, to the local man showing him around. The guide then explains that 200 years ago a nawab built the palace to house hundreds of girls, "victims of his lust." 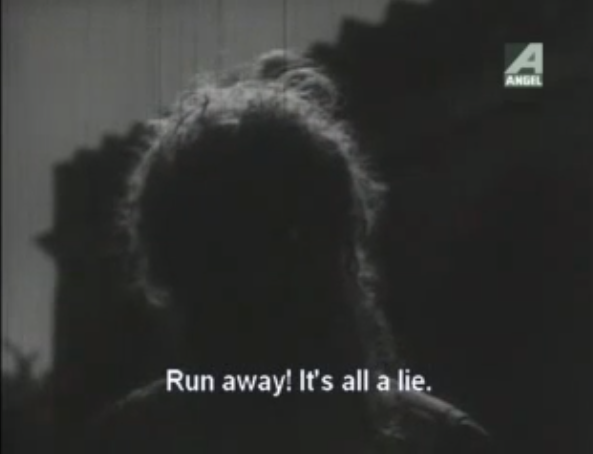 "Run away! Run away!" bursts forth again, this time clearly the voice of the local madman. Never one to let the ravings of a lunatic get in his way, the otherwise sensible Soumtira insists on spending his nights in the palace no matter what rumors about it the locals (including Chhabi Biswas as the postmaster) throw in his path. Even if you've never read the story, now you probably know approximately where it's going, with all these good gothic romance ingredients in place, as well as the faint trace of Madhumati. Indie Quill and I are both new enough to Bengali cinema generally that we don't feel confident making grand assumptions about how stories will play out or conclude, but barring radical intervention by uncontextualized plot elements, there were only a few reasonable options for how Khudito Pashan would shake out. Sure enough, the ghosts entangle Soumtira in their history from the nawab's time, and the lines between now and then, between real and fevered imaginations and superstitions, blur into the dramatic resolution. though she is perfectly happy to lure him through the palace while looking varyingly sad and coy. By the end of the film I realized that this is not just a creative way to handle story without words but also connects back to her history in the palace 200 years ago. And like the lead character's namelessness, the lack of words amplifies how un-real this all feels, with identities, chronologies, and explanations not pinned down. 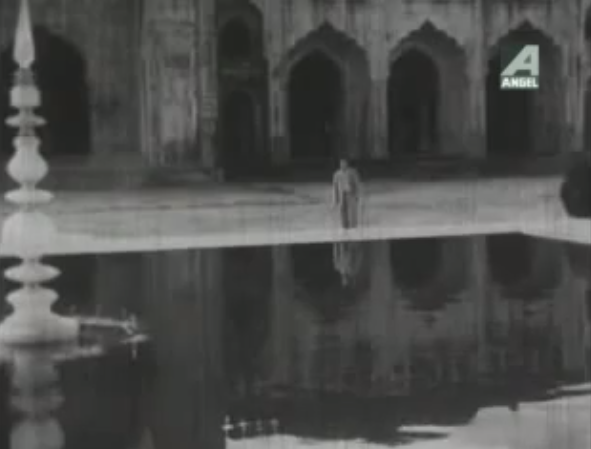 The ghost story even begins so cleverly: Soumitra is just starting his first night in the palace, and, standing alone in the courtyard, picks up a pebble to toss into the fountain. Just as he raises his hand to throw it, he hears a faint tinkling like anklets and follows the sound inside to the shadowy hallways. He is drawn into the illusion of the ghosts' world before he can shatter the reflected illusion of the palace in the pool with his stone. I loved this—the history of the place compels him to heed it and interact with it, and it does so by hooking into his rational side ("I heard a noise, so I'm going to go find out what it is") rather than singing to him in his sleep or something similarly dream-like. While I am grateful for the film's romp through the period-piece costume closet, I could have used more. But then again, it wouldn't have made sense for the modern-day characters to walk around in Mughal finery, so that's fair. but it's not really fair to call him inept either. He just doesn't have any information. I like the irony of that—a paper-pusher with no information. 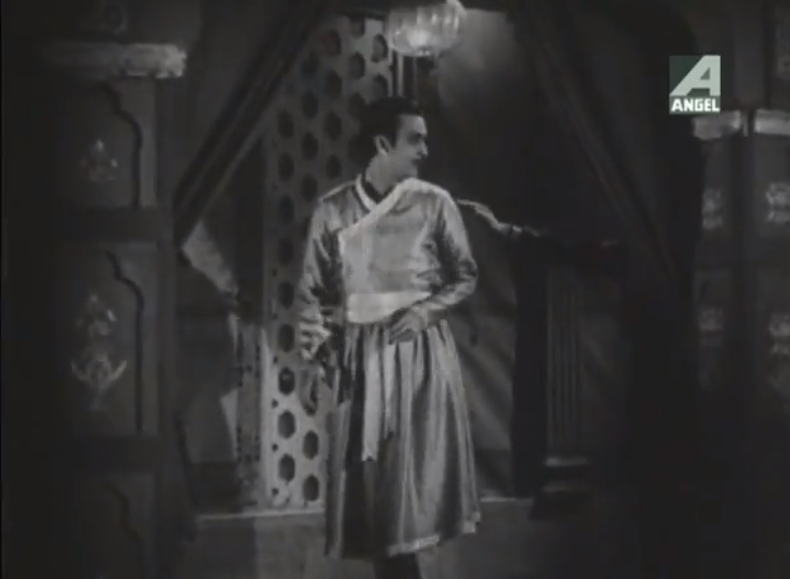 "The unravelling of the romantic mind," as an article in The Asian Age says about a staged version of the Tagore story, is evident on his face and in his frame. I love the pairing of those concepts, the romantic, which he clearly is, drawn to live in the old palace despite common sense and mooning over its paintings, and a sharp mind, trying to figure out what's going on and why he reacts as he does. He is dreamy and confused and unwilling to stop expressing himself or to leave this woman he loves without knowing why or how. 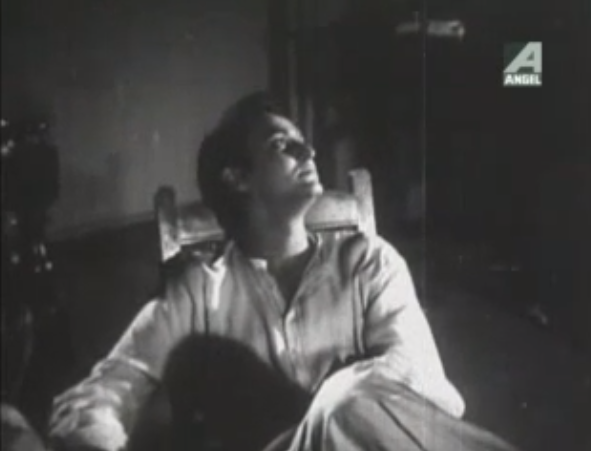 As I have probably mentioned in other posts about Soumitra Chatterjee, I have a very low tolerance for real or reel brooding, but somehow this actor does it in a way that expresses the character truly being troubled and thinking very hard about his problems rather than self-absorption, laziness, or simple moping. Maybe that's the shadow of Apu, but I've seen it in so many different characters, even in films not by Ray, that I will label it as one of his strengths as an actor. Luckily for him and the films he did, he and they were a good match for using this particular talent). He gives characters such vulnerability without making them weak or simplistic. He's so good at being human. He's also adept at this sort of small-scale white-collar flirting—bhadralok love, maybe—that is wordy, a little humble, and respectful of his target. 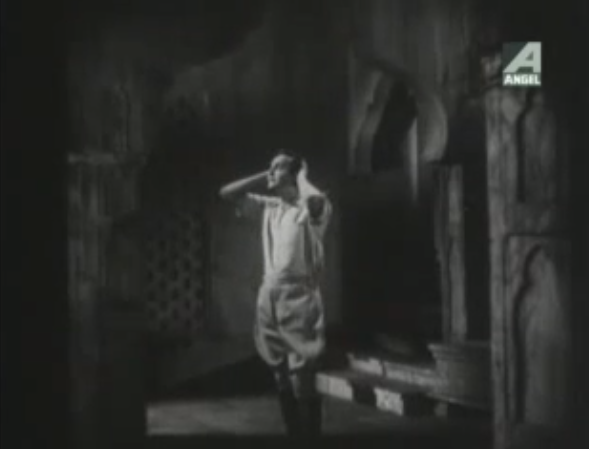 There's a moment in his interaction with Mumtaz's ghost when she is still silent and he's been pestering her and pestering her to tell him something about herself or why she keeps coming to him, and he finally says "If you won't talk, then how long can I keep blabbering?" Heehee. This kind of verbal cuteness resonates with me in a way that arm-flings on hilltops do not. Obviously a lot of the characterization is in the writing, but as ever he is an actor who can do so much with scraps of text, tiny gestures, the simplest movement of his eyes, whatever. Finesse: he has it, and he even manages to use it very well in the context of a ghost story in his second outing on screen. However, there are two things about his character and performance here that don't really work for me. First is the very few moments of reciprocated love between Mumtaz and Soumitra. I won't spoil how they met in the past, but their romance is unconvincing and kind of perfunctory. Their backstory isn't even in Tagore's original story; maybe the problem here is that its development was cut short in favor of ghostly wanderings or the music, leaving it feeling unsupported, rushed, and out of nowhere. 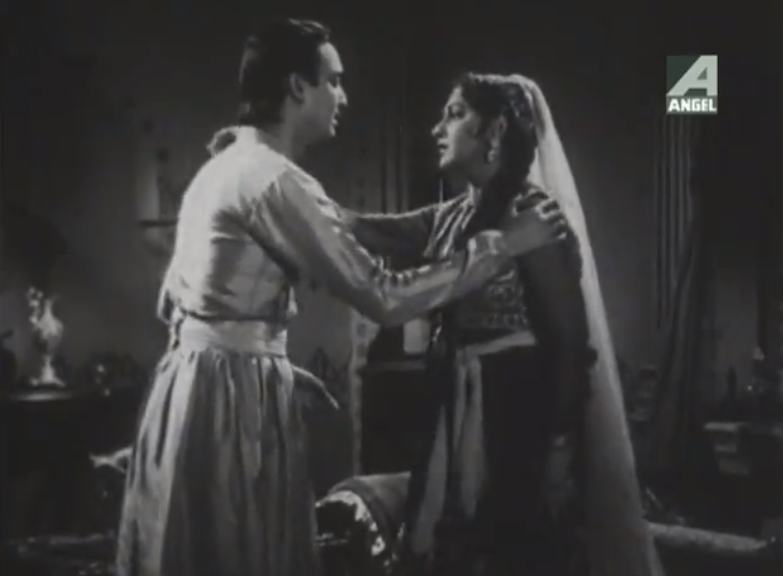 Their bond might also stem as much from his respect of her unwillingness to surrender to the Mughals (she's a captive) as from actual romance, but I didn't find the film clear on this point. 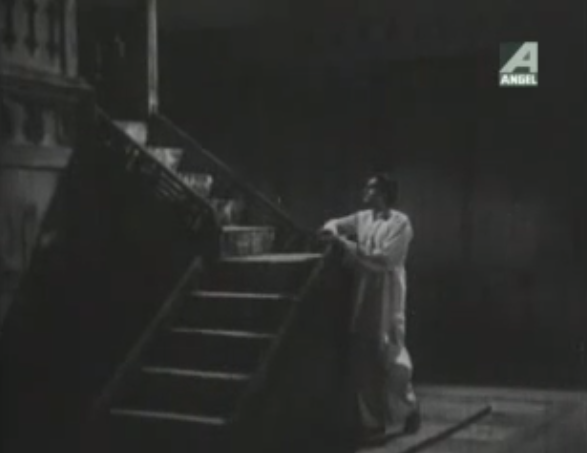 Mumtaz has spent most of the film silent, so we know very little about her other than that she is a sad ghost who gets dragged away by soldiers, and Soumitra's historical character is not decisively linked to his current-day one other than through his physical appearance (and in fact, historical Soumitra is reprehensible at first), so the film has a lot of work to do in giving either of them a personality that can carry part of a love story...and it doesn't quite manage it. Giving these two characters just a few minutes more to demonstrate who they are and why they are worth the big risks of epic love would have helped a ton. Even his intense staring into her eyes—which...let's just say it is very, very effective—does not a whole love story make. Meh. My other little quibble is with Soumitra's laugh, which has also bothered me in other films. In this one, the postmaster actually has dialogue about it—"Why are you saying you have a small life? Hearing your laugh, I understood you are large-hearted, like the sea"—but that description does not match what it actually sounds like. It's a regimented, mechanical "ha ha ha," like an alien reading from a textbook who hasn't yet mastered the humanity of that very basic expression. In fact, Chitti from Endhiran probably laughs more convincingly, but then again he's scripted by Rajnikanth, so he should do everything better than anyone else. The laugh detracts from an otherwise convincing portrayal of a relatable, very human man. Overall, Khudito Pashan is good ghosty fun, full of atmosphere, shadows, mysteries, a hint of tragedy, and some genuinely sweet moments. 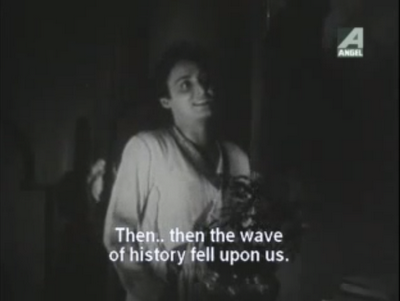 If you dislike Soumitra Chatterjee, this is probably not the film for you, because he's in almost every moment of it. 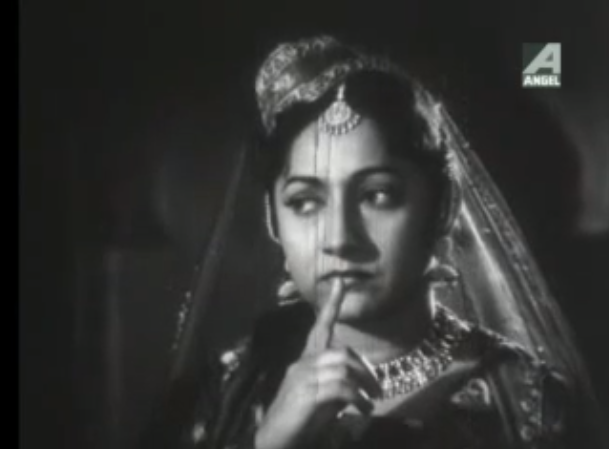 And as with Jhinder Bandi, you could just turn on this film and listen to it because the music is so wonderful. If you have read the story on which it's based, I would love to know your opinion of how this works as an adaptation. Apparently Gulzar's Lekin is based on the same story? Thoughts? I read the story after seeing this, and overall I'm impressed at how it was transformed into a film. The only aspect I find different (which might be a subtitling issue) is the sense of ominous peril. 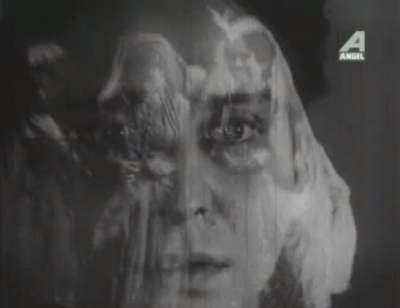 The palace in the film strikes me as strange and creepy rather than something that will definitely kill you. The stones are not as hungry. However, none of that changed my opinion of the film. It's just a slightly different spin on the story—perhaps a more filmi one, with its emphasis on romance. Khudito Pashan is available to rent for $.99 in the US on Angel Digital's youtube channel here. It is not, for reasons that clearly stink, available in India. There is another upload by Angel of the same film in 8 parts, but it leaves off the last 20 minutes of the film, which we discovered the hard way. And as a special treat for all my sonpapdis, here is Soumitra in jodhpurs and riding boots. I'll leave you to discover him dripping wet in Mughal silks on a moonlit beach on your own. * Thanks to Samit, who had no idea what he was starting by suggesting that sonpapdi was the correct sweet-based analogy for Soumitra Chatterjee (and no, I don't remember exactly why—something about having nutritional content yet also being supremely delicious? ), a crew of us on twitter who rave about the actor refer to him as Sonpapdi (or the Maha Sonpapdi, if we are feeling very silly) and even sometimes to ourselves as the (lesser) sonpapdis. ** "Yeh jhoot hai! JHOOT" is probably my favorite bit of filmi dialogue ever, and this movie offered up a nice little twist with "Sub jhoot hai!" wow, i never made the connection, but this movie bears a really strong resemblance to last year at marienbad. interesting that marienbad - 1961, and khudito pashan - 1960. Nice review and I loved this movie when I watched it, even though the feel the expository last half hour kinda spoils thing s for me. I would have preferred for the apparitions to remain mysterious. Sapera - Ha! I haven't seen that one but it sounds fascinating. Suresh - TOTALLY AGREE about the expository last half hour, especially after watching it twice and reading the short story. I'm not sure why they felt the need to re-appropriate that bit of the story and assign it to Soumitra and make a weird sort of reincarnation thing. The friend I watched this with points out that it also just makes his character less likable, since he's the nasty woman-purchaser. 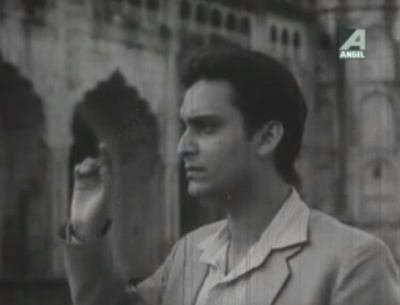 If you are a big sonpapdi fan, then you can try seeing my favorite non- Satyajit Ray directed Soumitra movie: Jhinder Bandi (http://www.imdb.com/title/tt1073122/?ref_=fn_al_tt_1). 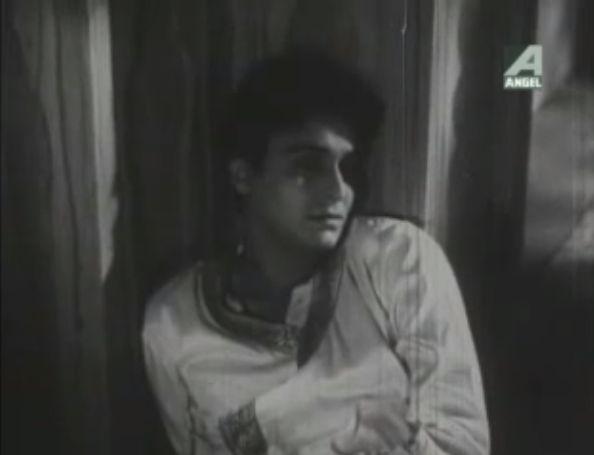 In that movie, Uttam Kumar is the hero while Soumitra plays the villian/ anti-hero. And for a change, he does not look pansy while Uttam Kumar plays the typical pansy bengali hero. Average movie, good acting based on a good bengali novel which was actually "inspired"